Engineer: Kadrmas, Lee & Jackson, Inc. In the last 5 years, Dickinson’s population has exploded along with the service needs of its citizens. One of the major needs culminated in the construction of a larger, newer, and state of the art hospital. 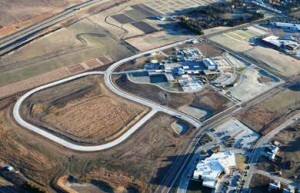 When St. Joseph’s Hospital began its design process, the City of Dickinson knew they would have to do an upgrade on Empire Road to accommodate traffic to the new hospital. What they accomplished with this project became both a functional and appealing new access for the hospital and the general undeveloped area. The newly redone street consists of nearly one mile (0.93 mi) of 8” thick pavement, 9,551 linear feet of curb and gutter, 198,920 square feet of placed pavement, and 6,237 cubic yards of concrete. The higher slump pavement placement was done by pumping and then using a bridge deck paver to finish. The curb and gutter was telebelted due to the 1” slump needs of the mix. All concrete placements were completed in less than three months. Though the city has not formally indicated such, it appears the pavement will meet the City of Dickinson ride spec without necessary grinding remediation. The result is a light, bright aesthetically pleasing and safe access to the new St. Joseph’s Hospital that will provide years of service to the Dickinson community.